To assist users in determining their monthly/quarterly payments to the HMRC, a dedicated reporting facility is available within BrightPay. 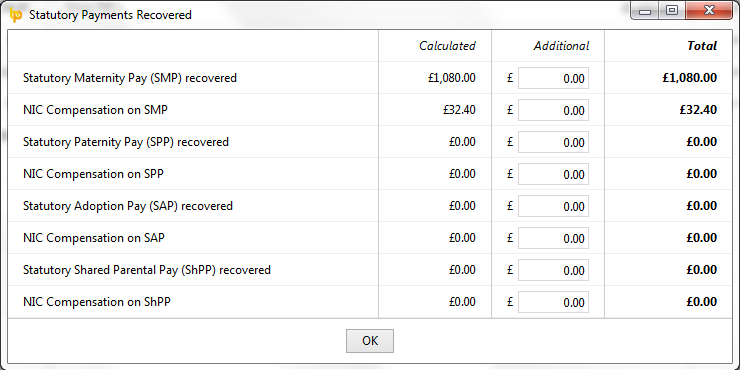 To access this utility, select HMRC Payments on the menu toolbar. When the 'HMRC Payments' tab is selected for the very first time, you will be asked to set your HMRC Payment Schedule. Choose Monthly or Quarterly, as per your requirements. A summary of your tax, NIC and student loan liability for the first month or quarter of the tax year will now be displayed on the screen. 1) If you have received any funding from HMRC in the month or quarter to refund tax to employees, enter this amount in the field provided within the Tax section. 2) If you have suffered any CIS deductions in this tax period, enter accordingly. 3) If you have received any funding from HMRC to pay Statutory Pay, enter this amount in the field provided within the NIC section. 6) Under 'Year to Date', indicate whether you wish to carry over any shortfall from a previous tax period, if applicable. 7) If you wish to enter an adjustment of your own (e.g. HMRC are allowing you to offset an overpayment/ refund against your current PAYE/NIC bill), simply enter the amount in the 'Adjustment' field. Both a positive and a negative amount can be entered here, as required. 8) At the bottom of the screen, the amount due to HMRC will be displayed. If you make a payment to HMRC for this tax period, enter this amount in the ‘Amount Paid’ field and enter your ‘Payment Date’. (Please note a date must be present in the ‘Payment Date’ field before you can view the next period). 9) If no payment has been made for this tax period, simply leave the ‘Amount Paid’ field as zero and enter the last date of the tax period in the ‘Payment Date’ field. 10) Click ‘Save Changes’ to update the summary. After changes have been saved, both the P30 and P32 Employer Payments Record will be updated to reflect any amounts made to or received from HMRC in the tax period in question. If at any time you would like to switch your HMRC Payment Schedule from monthly to quarterly or vice-versa, simply click the ‘Switch’ button on the menu bar. Please note, however, that switching from one schedule to another will result in the loss of any amounts already entered in the previous schedule and will need to be entered again. Under RTI, If you would like to recover statutory payments and/or CIS deductions suffered, an Employer Payment Summary (EPS) must be submitted to inform HMRC of the reductions you are entitled to make to the totals already submitted on your Full Payment Submissions (FPS). If an EPS is due to HMRC, BrightPay will prompt you to do this as soon as you enter a payment date in the tax month or quarter in question. Please note: if you have moved to BrightPay mid tax year from another payroll provider and have recovered statutory pay amounts in the previous software, amounts already recovered should be entered within the ‘Statutory Pay Recovered’ utility within ‘HMRC Payments’ to ensure that you report the correct recoverable year to date figures to HMRC.